The consumer drone explosion of the last few years has been mostly limited to quadcopter-style multirotors. Until now. Meet the Disco, Parrot’s super-fast drone party in the sky. The Disco is smart and it’s easy, but the coolest part is that it rips. This thing can go up to 50 mph. 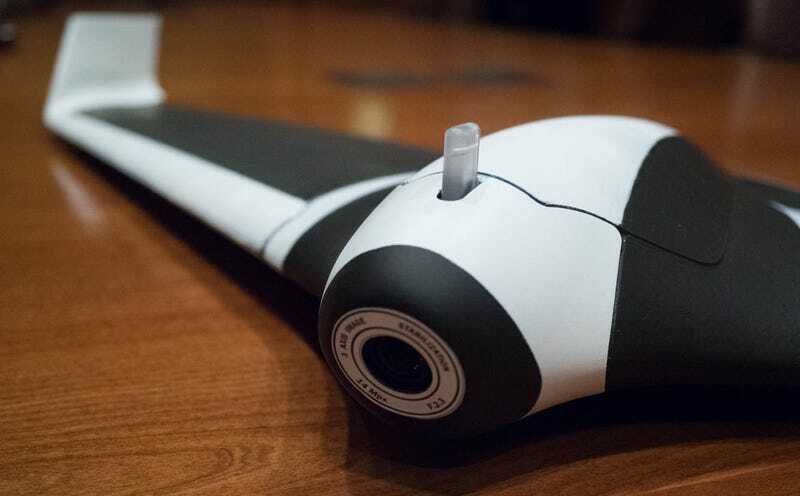 The new fixed-wing drone is the fist consumer camera drone of its kind. It’s got a rotor on its tail, but the whole structure of the vehicle is really more like that of a plane. The Disco’s got a 1080p HD, digitally stabilized camera in its nose, with two big wings forming a “v” around it. Each wing has steering flaps which are controlled by motors. About that steering—it should require very little expertise. In a briefing, Parrot emphasized that far from an enthusiast drone, it expects everybody to be able to fly it. Using the Parrot app, the drone basically flies itself, and if you want to fly it with your hands using the company’s fancy drone controller hardware, you don’t need to worry about keeping it steady or anything. A single joystick controls altitude as well as left and right directions. The Disco is outfitted with a bevy of sensors that allow it to maintain stability. These should be pretty familiar if you know anything about drones. On the bottom, the drone uses both a sight camera and ultrasound to maintain stability. A pitot sensor in the nose determines the drone’s speed. As with other drones, if you lose track of the Disco, or it senses that it’s lost, it’ll use GPS to get itself home. Smart drone. Oh and the way you’re supposed to launch this thing that’s actually really amusing. Start up the propeller and then pick it up and throw it like a paper airplane. From there, the drone will fly up to fifty meters and enter a circular holding pattern until you tell it what to do. When it’s time for the the drone to land, it does a sort of glorified crash landing—this thing has no landing gear. The Disco isn’t exactly a grab-and-go toy. It’s got a 1.1-meter wingspan, though thanks to tough foam construction, the drone weighs just 1.5 pounds. (We’re told the foam is plenty tough unless you plan on crashing it into a tree. The tree wins that fight.) A high-capacity battery, allows the Disco to fly for 45 minutes. There’s no word on when we might get to actually fly the Disco in real life or how many bucks it’ll to cost when it drops. We’re told at the very least that it will be a real thing you can buy in 2016. Sick.